A ‘Workplace World Cup’ event organised by Leicester-shire and Rutland Sport is set to take place at Brockington College, Enderby on Thursday 6th June 2019. 2019 is the year of World Cups! England Netball take on the world in Liverpool, England Rugby travel to Japan in September, Women’s Football will descend on France for the eighth FIFA Women’s World Cup, and England & Wales will host the Cricket World Cup for the fifth time in May. 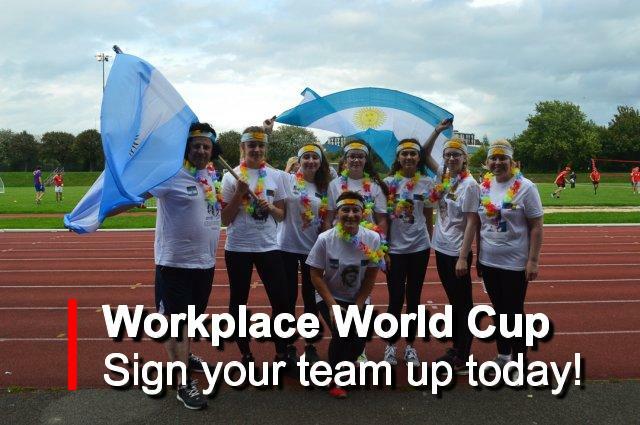 And now … Leicestershire, Leicester and Rutland based workplaces will have the opportunity to join the World’s stage and showcase their skill and sportsmanship as they take part in a multitude of sports at the Workplace World Cup. All activities are ZERO experience necessary and as a team you rotate around each activity as well as visit the Challenge and Health Zones. Activities will be led by fully qualified coaches. Friends and colleagues can come together to experience a multitude of sports and the chance to showcase their skill and sportsmanship! From Rounders to Volleyball to Cricket and Handball participants will be able to take part and have fun. A team has to be a minimum of 8 players, maximum of 10, with one member of each gender on a team. Sport Zone – team sport fixtures including Rounders, Volleyball and Handball. Challenge Zone – battle it out for individual awards that will contribute to your overall team score in a variety of quick fire challenges including Table Tennis, Cricket and Netball. Health Zone – interactive activities designed to support you to lead a healthy lifestyle, particularly at work. Ticket includes a free t-shirt, water, team flag, and hot food voucher. Participants will be assigned the team name of a country participating in one of the four World Cups listed above. Extra points will be awarded for appropriate team fancy dress! The Workplace World Cup is open to businesses/workplaces of any size and type in Leicestershire, Leicester and Rutland. It is a great opportunity to socialise with your colleagues outside of work, try new sports and have the chance to lift the Workplace World Cup! Time: Arrival will be between 17:00-17:30, with the event starting at 17:30. A team has to be a minimum of 8 players, maximum of 10, with one member of each gender on a team. Each workplace can enter up to two teams on a first come, first served basis.